New Delhi: India’s commodity exchanges are poised for steady growth over the next few years after annual turnover more than quintupled to $2.5 trillion since futures trading started in 2003, but political hurdles hinder more dramatic development. While a bill to strengthen market oversight and free up entry of financial institutions and the launch of new products has hung fire since 2005, government moves such as bans on some agricultural futures trading have fed regulatory uncertainty. 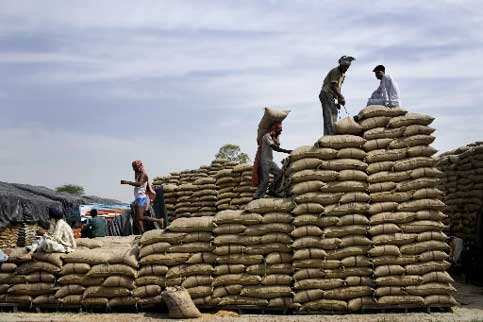 “The bill is critical not only for growth but also to unshackle chains that bind the market and restrict its forward movement," said Tanushree Mazumdar, vice president at the National Commodity Exchange, India’s second largest. “Besides allowing trading in options and indices, it will give more teeth to the regulator." But politicians worry that unbridled futures speculation will drive up food prices, particularly as double-digit inflation proves resistant to the Reserve Bank of India’s (RBI) efforts to rein it in with 12 rate hikes in the past 18 months. “There is no political will, no one wants to take a call in the government now," said Kuljeet Kataria, head of business alliance at broker Unicon Investment Solutions, which does $125 million to $167 million worth of futures trades every day. “You could hope for something in a couple of years when these things settle down," he said, echoing a timeline suggested by at least two government officials who asked not to be named. Yet analysts see tremendous potential in Indian exchanges, even though they have lagged Chinese forward trading which made up 51% of commodity derivative volumes traded worldwide last year, according to World Federation of Exchanges. “Globally, commodity derivatives volumes are 35 to 40 times of the physical market but in India it is just 4 times," Nirmal Bang, a leading broking firm owner, wrote last month. “We expect the Indian commodity futures market to reach at least 15 to 20 times by 2015," he added, painting a picture of dramatic growth in volume since physical commodities contribute 45% to GDP. India, the world’s biggest buyer of bullion and the second-largest grower of wheat and rice, has 21 commodity bourses, five operating at the national level, trading in about 80 commodities ranging from gold to carbon credits, though 8 to 10 commodities make up the bulk of volumes. Indian commodity futures volumes have grown to Rs112.52 trillion ($2.5 trillion) in the financial year 2011 from Rs20.53 trillion in the year 2006. Average monthly volumes now stand at about Rs6 trillion. Turnover in the commodity futures markets has outstripped that of equity derivatives, growing 30% since 2008 against a 22% increase in the latter, as investors found a “store of value" in commodities in a slowing global economy. But future growth will only be unlocked by reform moves, including steps to allow foreign and domestic institutional investors, banks and insurance firms to trade and open up options and index businesses. Higher volumes will also spur consolidation of exchanges, much as in the United States. China has just three. “Regional exchanges have already been marginalized and they won’t be able to sustain themselves, they’ll have a big challenge in surviving," said Anil Mishra, chief executive of the National Multi-Commodity Exchange of India, the country’s third-largest, with turnover of $46 billion in the 2009-10 fiscal year. India must also overcome infrastructure deficiencies and build an effective warehousing system for its commodity derivatives market where 1% to 5% of total trades are settled by physical delivery, traders say. Although India is a top commodity producer and consumer, turnover on its commodity exchanges is just 5% of those in China -- which limit the role of foreign companies and also do not offer options -- and less than half a percent of US futures trade. Since 2003, government intervention to control key commodity prices has led to several flip-flops in forward trading policy. The government banned futures trading in rice, wheat and two varieties of lentils in early 2007 and sugar in 2009 in its efforts to curb rising food prices. The ban on rice remains. Such moves have proved little help in controlling inflation, bolstering trading firms’ views that fears about speculation driving up prices were unfounded and freeing up the futures market could only bring stability to commodity supplies. Also, the government is beginning to see that beyond the massive volumes, forward trading could bring price protection to farmers and their families, who make up almost 60% of the country’s 714 million voters. “The government can no longer ignore the fact that futures trading offers a great price discovery platform that farmers can benefit from," said D. H. Pai Panandiker, head of private think tank RPG Foundation. “Farmers can plan better when they know what price their produce is going to fetch."